2Lt Oliver B. Larson (P) - Flew as CoPilot on his first three missions (#205,206 & 207) with an experienced Pilot, F/O Robert B. Kirkland. 2Lt George B. Kersting (CP) - Stood down on the crews first three missions. 2Lt John J. Draves (B) - Did not fly on mission #212. Flew as the crew Navigator on missions #218 & 221. Substitute Togglier used for Bombardier position. Sgt Charles R. Sweeney (BTG) - Did not fly on mission #205. Substitute BTG used. S/Sgt O'Connor (E), S/Sgt Mullaney (R), Sgt Holland (WG) and Sgt Philson (TG) - Flew on all of the crew's seventeen missions. S/Sgt Huber D. Ward (WG) - Flew on crew's first combat mission. Crew size changed from 10 to 9 men and the second Waist Gunner position was deleted from the crew. Departed the 358th BS on 18 July 1944. Subsequent duty station and assignment unknown. Mission #212, 25 July 1944 - 2Lt Oliver B. Larson (P) was preparing to land in #42-102453 Princess Pat, 358th BS (VK-J). He came in too high and failed to go around for a better landing approach. The B-17's wheels hit in the soft ground at the runways end and nosed over. There were no injuries but the badly damaged B-17 flew no more combat missions and was salvaged to the "Boneyard". Mission #229, 15 August 1944 - To Wiesbaden, Germany in B-17G #44-6086 My Blonde Baby 358BS (VK-L). Squadron was attacked by 25 FW-190s south of Wiesbaden, after bombs were dropped. Nine aircraft were lost (7 -358th BS Crews and 2 - 427th BS Crews). There was no fighter coverage at the time of the attack. The B-17 was burning in the #3 engine and bomb bay. The right wing broke off and the aircraft was spinning downward with a violent centrifugal force. 2Lt Larson (P) was unable to reach the nose escape hatch and he exited through a hole in the belly. Three panels of his parachute were ripped and he landed hard badly spraining his ankle which hurt for two years. The B-17 crashed at Sedffrin, Germany (MACR #8172). 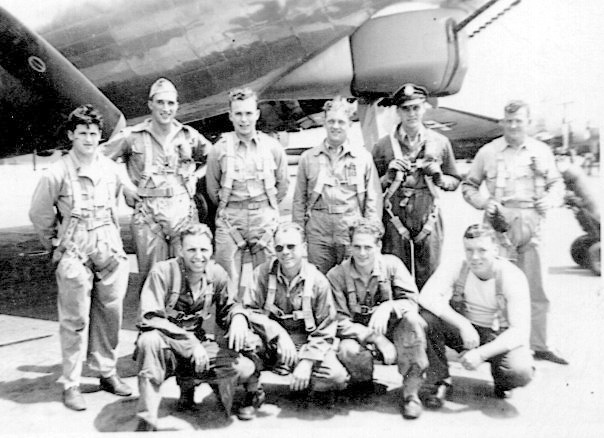 LARSON CREW's B-17s: The Larson Crew flew in seven different B-17G's during their 17 combat missions. All of these B-17 experienced a tragic end. Princess Pat #42-102453 358th BS (VK-J). Larson Crew: Mission 212 Fate: Crash Landing 25 July 44 on 10th mission. 358th BS Lt Larson (P) Badly damaged. Salvaged. The Floose #42-97298 358th BS (VK-H). Larson Crew: Missions 215,217,218,221 Fate: Crash landing on 102nd mission, 24 Dec 1944 at Snetterton Heath, England, 92nd BG(H) Lt W.H. Hackett (P). Pilot did not completely lower landing gear causing gear to collapse on landing. Was badly damaged and salvaged. 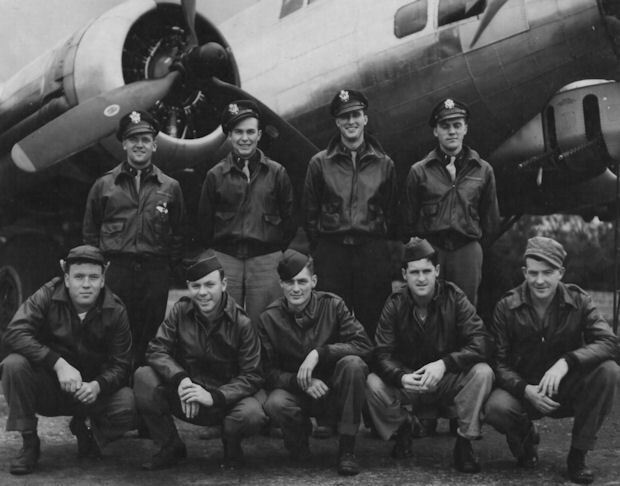 The B-17 had been lent to the 92nd BG(H) for this mission.